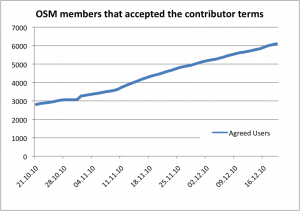 Growing agreement to CT & relicensing OSM Data : Neis One! I repeated this analysis with the current OSM data: In the first attempt I used the last modifier of an OSM object (node/way/relation) as the owner of the object. During the second analysis I used the creator (version=”1″) as the owner of the object. 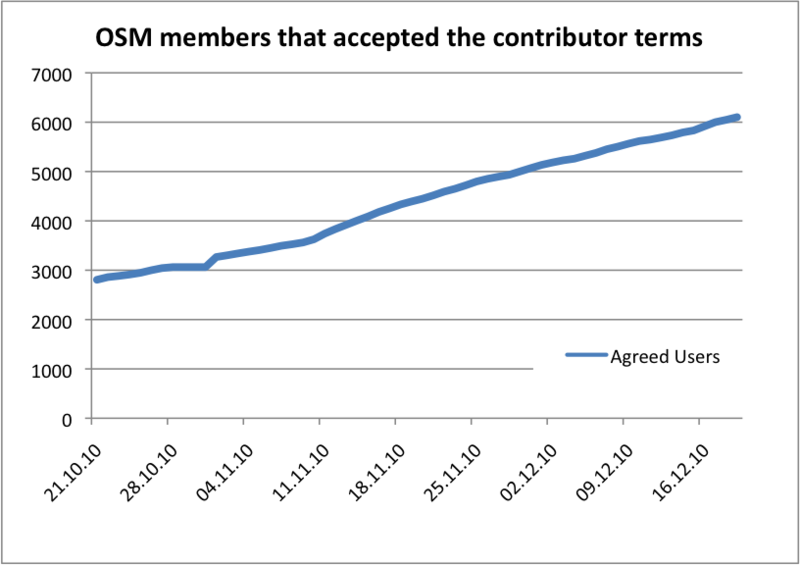 Notice: The last numbers of OSM objects could contain deleted objects too. I only checked and counted the version=”1″ of a object. So probably the numbers for relicensing OSM objects (version=”1″) should be smaller! However, in my opinion the results are interesting enough to publish them here anyway. Can anyone confirm these absolute numbers? I can at least confirm, that we got the same numbers for “last edited” nodes, ways and relations on http://odbl.de in the world stats. But as we didn’t use the full history dump we have slightly different numbers for “version 1” nodes, ways and relations, because in the normal dump we only have version 1 data which was not altered after creating. I’d like to know which data is transferred to the ODbL database. How many conrtibutions to a node have to be ODbL to accept them for the new database? A 100 % or less? Interesting question! I think probably 100%, but to the best of my knowledge the OSMF did not mention anything about that yet. Or has anyone further information ? I’m still not convinced it’s the best move, that the new licence is too young and untested, not to mention it would have been great to work with CC to produce a licence under their umbrella (they are recognisable to people). Didn’t accept public domain offer, because I believe in copyleft being the right thing to do. Not sure why OSM even considered it.